Do you know the #1 concern of the prospective students applying to your school? What criteria are they using to narrow down their school list? Why are they choosing your school over your competitor? What information are they looking for when they come to your website? How do they find out about your school in the first place? What resources are they using to look for information? Who else influences their decision? Answering these questions is the key to creating effective content to attract the qualified applicants you want to your school. The business world uses a marketing intelligence tool called “buyer personas” to answer these questions about buyers, but this method is rarely taken advantage of by admissions teams in the higher education space. A buyer persona is a research-based representation of a typical buyer and their buying (decision-making) process – how, when, and why they make a purchase decision. 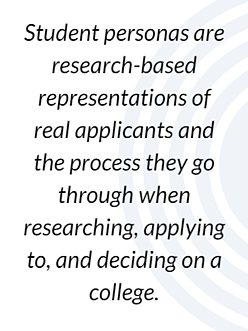 Student personas are research-based representations of real applicants and the process they go through when researching, applying to, and deciding on a college. What these personas are NOT are a smattering of demographic information about your prospective applicants. While demographics are certainly a piece of the puzzle, the most important information is based around the decision making process (from the moment they start considering going to college, through researching their options, to ultimately choosing a school). When I discuss prospective student personas with my EDU clients, occasionally marketers will respond, “Oh, our marketing team already made those.” But often what they have created is just a quantitative analysis of their typical applicant pool (geographic location, average GPA, average SAT scores, ethnicity, family size, family income, etc). This is a great start on the who, but doesn’t cover the what, where, why or how of their college search process. What questions should student personas address? Triggers – Why are they looking at colleges? 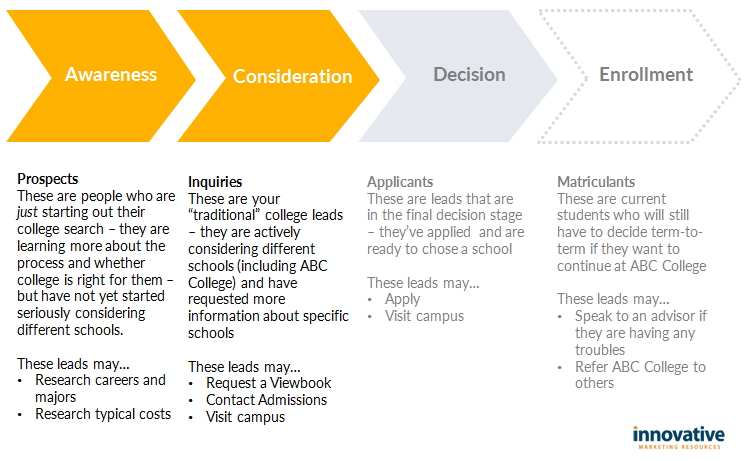 Decision criteria – How are they comparing schools? What information do they care about? The “Application Journey” – How does the research + consideration + application process look? When do they start looking, visiting, and applying to schools? Who else aids and influences their decision? 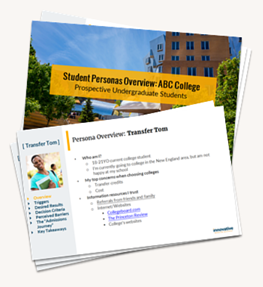 Want to learn more about student personas and the research they include? Download the example below.